Nice photos! 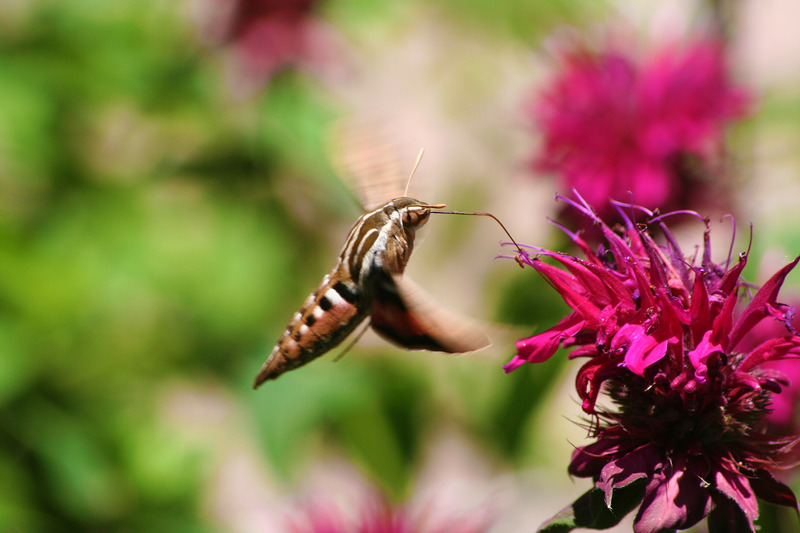 Those big guys have fooled us into a second look thinking they were hummers, too. Gorgeous photos! I’m glad that your deep-seated hatred of moths in general did not cloud your vision from seeing the beauty in this one. Wow, those are great captures! Who knew these moths have such a long tongue!! That is a great series of pictures! Beautiful coloring on the wings. I wonder if it changes color based on what nectar it eats. Thanks for sharing something that I’ve never seen. Oh, he is beautiful, especially that stripes and pink on the wing. 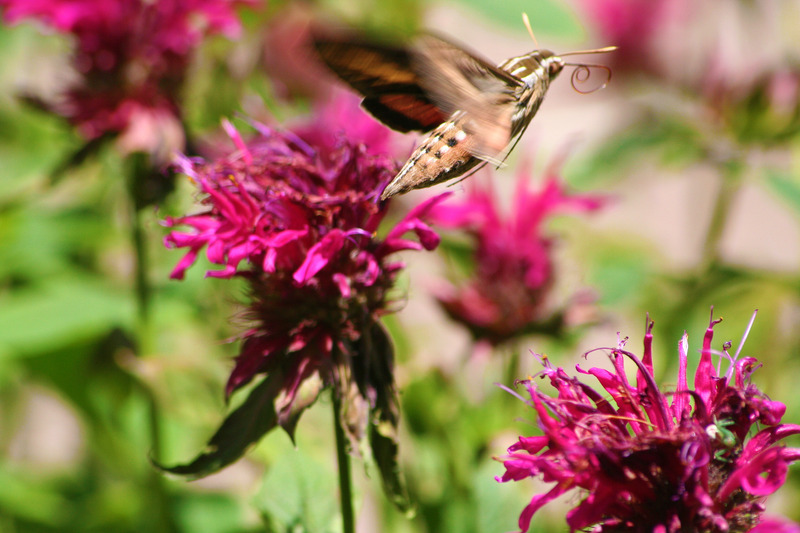 I’ve been having some type of hawk moth visit my phlox but I am not sure what kind. Great close ups of the probiscus!!! And now I am wondering why I don’t have bee balm in my flower garden. How beautiful. I’d never heard of that kind of moth before. So sweet! Love the pink coloring on the wings. We don’t get pretty ones like that, just plain old brown ones. 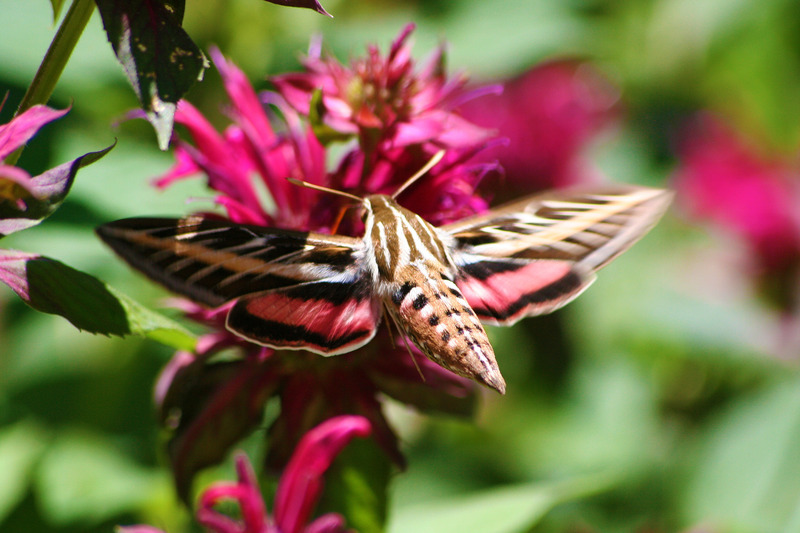 The photos are amazing – I didn’t know there was such a moth! I don’t think I’ve ever seen a moth with pink before! How cool. Thank you for sharing all of this with us! Those are outstanding photos worthy of publication. Seriously, especially the one where you caught the probiscus. They are pretty and BIG! Wow. this helped me identify what i just saw!!! Just saw one of these in my garden at dusk. Thought it was a baby hummingbird but friendlier. Beautiful insect and quite an imposter! Not a common sight in the Pacific Northwest. I just saw one enjoying some flowers on my deck. Thanks to these photos I know what it is. Gorgeous. We live on the top of an Ozark Mountain on the south shore of Bull Shoals Lake. 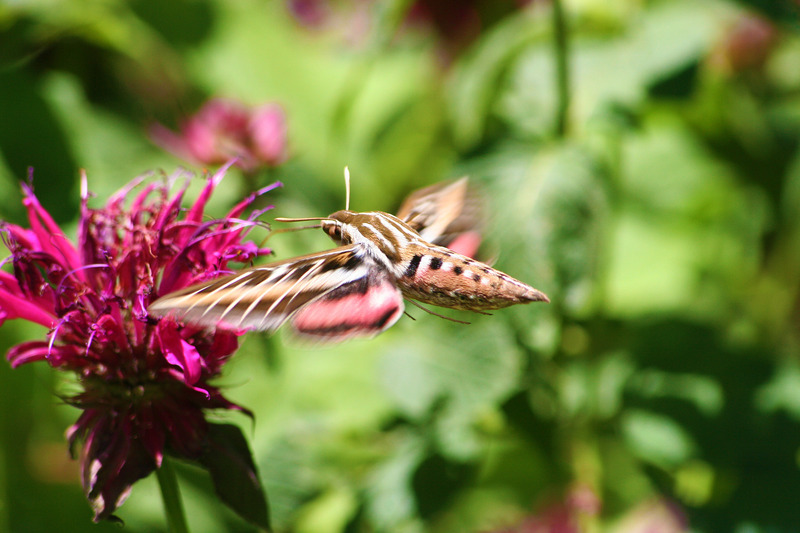 Been seeing lots of these in my zinnias….amazng to watch them flutter from flower to flower! Thanks for posting these great photos. Just saw one of these beauties the other night and knew it wasn’t one of my hummers. Have never seen one of these in northwest Indiana, what a sight! I saw one today enjoying the nectar from grapefruit flowers in Arizona.